Sanna Annukka — THE HANNA BLOG Worked like a charm! 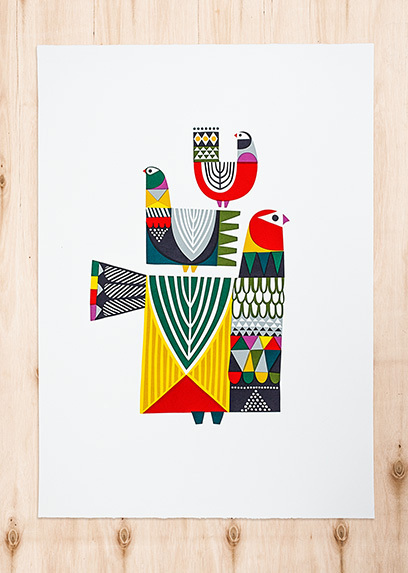 The half Finnish and half English artist, Sanna Annukka, colorfully weaves nature and folklore into each of her designs. Her work expresses a love of pattern, decoration and mythology often found in traditional cultures all over the world, but especially close to her heart are the Sami people of Lapland. Shortly after graduating college, Annuka began selling silk screen prints of her artwork in a small London shop. Her work caught the eye of the British band Keane, who featured her artwork for the cover of their second album. Soon after, Annukka found herself creating textile prints for the Marimekko design house. Her first collection for the all-star brand was inspired by the Kalevala, a famous piece of Finnish literature that originated where her grandmother was born. You can see more of Sanna's work on her website HERE.